For our fourth year in robotics, we built Hailstorm, the robot that rains down whiffle balls. At the Northern Lights regional, Hailstorm brought the team to the semi-finals, and was ranked 12th after the 2 days of competition, and at the 10,000 Lakes regional it helped the team bring home their first gold medal of the season. 2017 was our first year building a robot with a 2-speed transmission, and it helped us traverse the field very quickly in order to shuttle gears to the airship as well as push opponents out of our way. 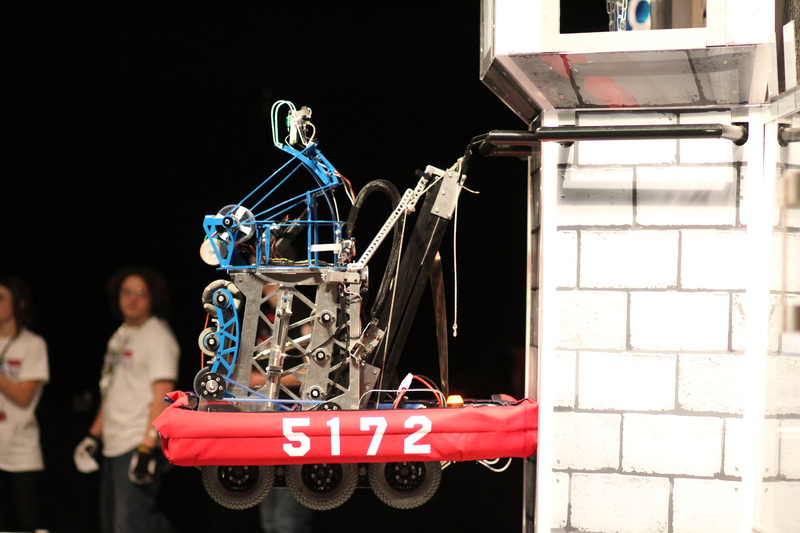 Apex was our Third year robot and is widely considered to be the best robot to have come out of our small school. After spending countless hours in every department to plan, prototype, build, test, and practice we ended up with a robot that brought home gold medals in the Iowa Regional Competition and the Minnesota State Competition, as well as silver at the Northern Lights Regional, it also took us to worlds where we lasted until semifinals in our infamously difficult division. With our versatile turret system we were able to shoot consistently from anywhere on the field, this was the primary feature on the robot and it is easily one of the various reasons of why we were met with constant success. 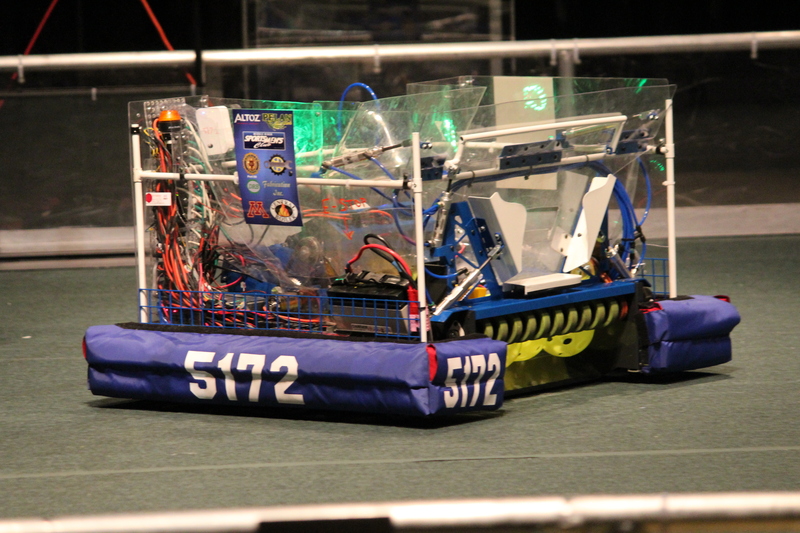 After the robot attended it’s last official event, it still lived on as a demo robot, and as a training device for upcoming drivers. Strengths: extremely accurate high goal shot, that can be achieved from any position on the courtyard. See Apex in action on Youtube! 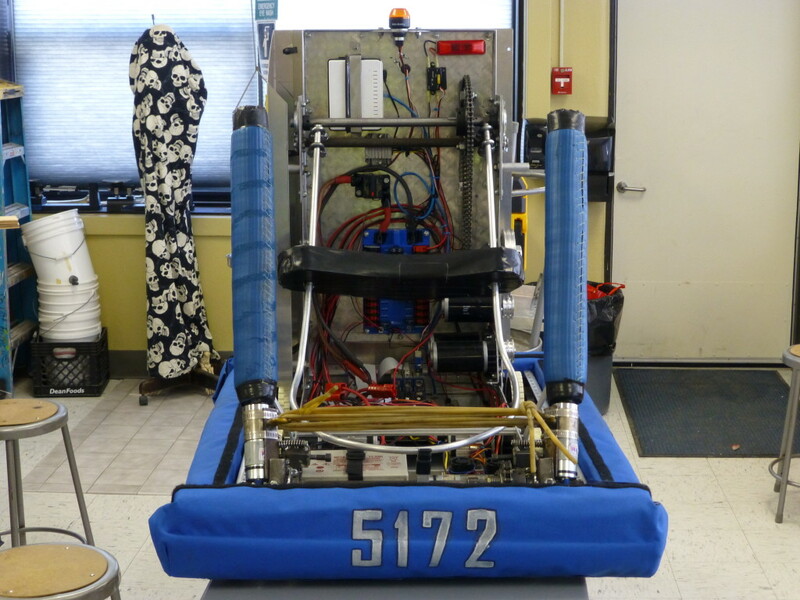 Vortex, our team’s second robot, was also built at Hlucny Repair. 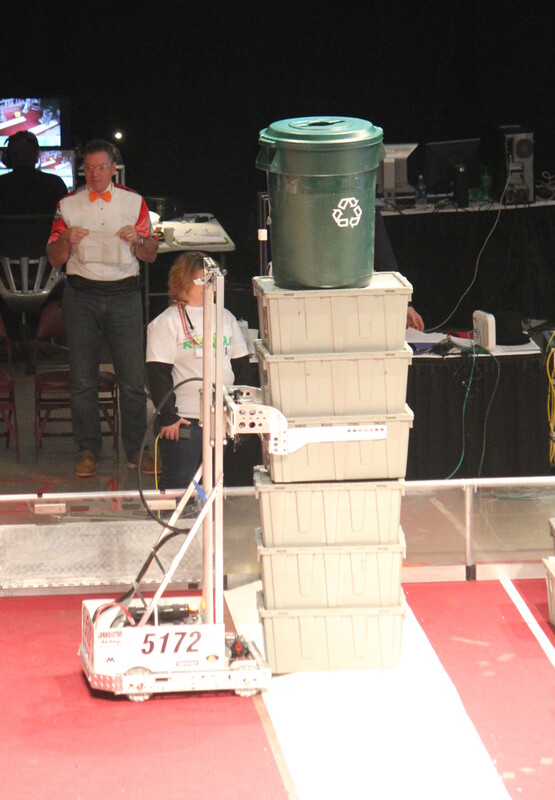 As the build season went on and as the robot got closer to its final design we realized that it looked a lot like the squeeze-a-matic that picked up square bails just like the totes in Recycle Rush. The squeeze-a-matic was a tool that our grandparents used to use that worked well, just like our robot. After the majority of the construction was complete we moved Vortex to DRB Fabrication, where we set up a practice field and fine-tuned our game skills. Vortex was a very well-built robot and performed exceptionally well at both the Northern Lights Regional in Duluth and the MSHSL Minnesota State Championships! Strengths: Quick and agile mecanum drive system, fast lift mechanism able to retrieve totes from landfill or chute and recycling containers, retractable arm able to grab recycling containers from middle step. See Vortex in action on Youtube! The first robot ever produced by our team, Triplex was everything we wanted it to be and more. It was built primarily at Hlucny Repair, a local diesel repair shop owned by Doug Hlucny, because the Greenbush Middle River School did not have the resources or space available to facilitate robot development at the time. The build team, led by mentor Doug Hlucny and senior team member Steven Hlucny, organized specific days when it would work to commit the repair shop to robotics. Since these days were far and few, the majority of Triplex’s construction took place on weekends and late evenings. This was okay, because Hlucny Repair turned out to be the premier place to build a robot; It was because of our access to professional metal construction tools and mechanical wisdom that we were able to produce such an outstanding machine our first year. Triplex took us a long way throughout the season, including the World Championships and the MSHSL State Championships; that’s something we’re proud of! 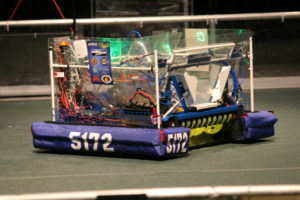 Even after the season of Aerial Assist was officially over, Triplex lived on as a demo and practice robot. Strengths: Accurate and dynamic motor-driven catapult, six-wheel drive traction setup, fast and simple pickup mechanism, consistent. See Triplex in action on Youtube!